This strawberry salad requires a few simple ingredients and takes just five minutes to make. 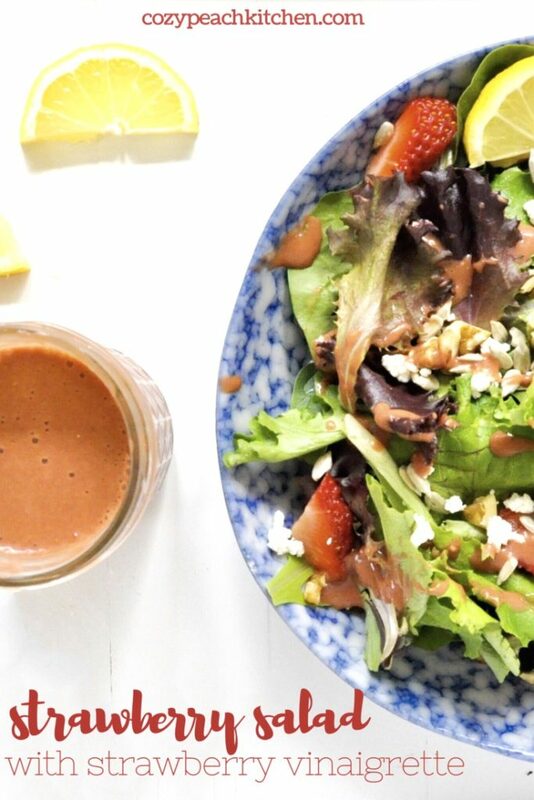 The strawberry vinaigrette is so good that you’ll be pouring it on everything! Did someone say strawberries? Yesterday for breakfast I had a strawberry breakfast bowl, then I made a strawberry cake, then today I made this strawberry salad and strawberry vinaigrette. Oh, and I impulsively bought a dress with strawberries on it today. Yikes. When strawberries are in season, the only rational thing to do is add them to every meal, right? Spoiler alert: I attempted to make tofu feta cheese for this salad, but I decided to save that recipe for another day. If I ever get around to getting it to taste how I want it to taste, I will definitely share it. Instead of tofu feta, I topped the salad with regular ole feta cheese (easily omitted or subbed for a dairy-free alternate). 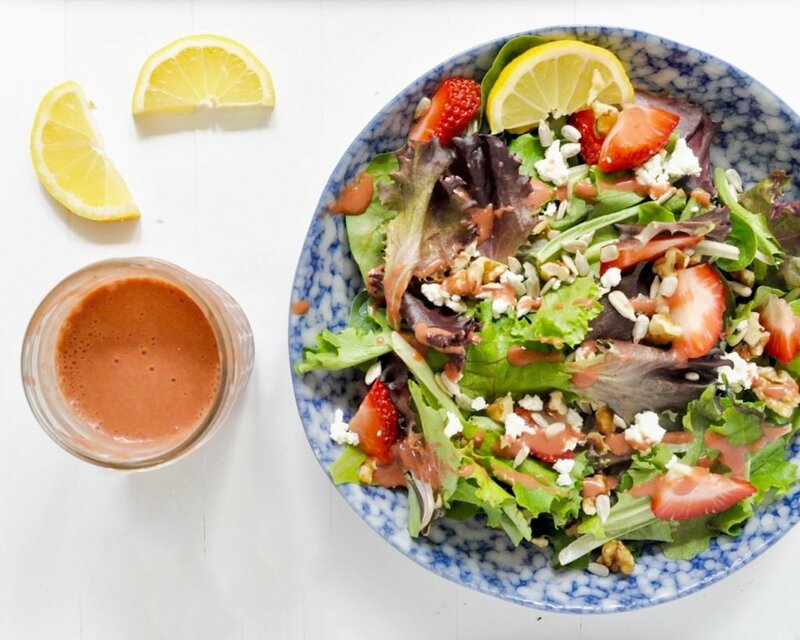 Combine the salad greens, feta, and strawberries with walnuts and sunflower seeds and you’ve got yourself a classic strawberry salad. 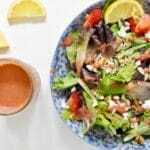 Lemons and vinegar lend a tangy taste to this vinaigrette, while strawberries and (a little bit of) oil bring a creamy texture. I like to blend up salad dressings in my blender. It makes for creamy, well combined dressings. If you don’t have a blender (which I didn’t until a few months ago – I depended entirely on my mom’s 30 year old food processor…) you can easily whip up the dressing by hand. This salad takes only a few simple ingredients and just a few minutes to make. Don't be deceived by the simplicity: this salad is tangy, creamy, and delicious! 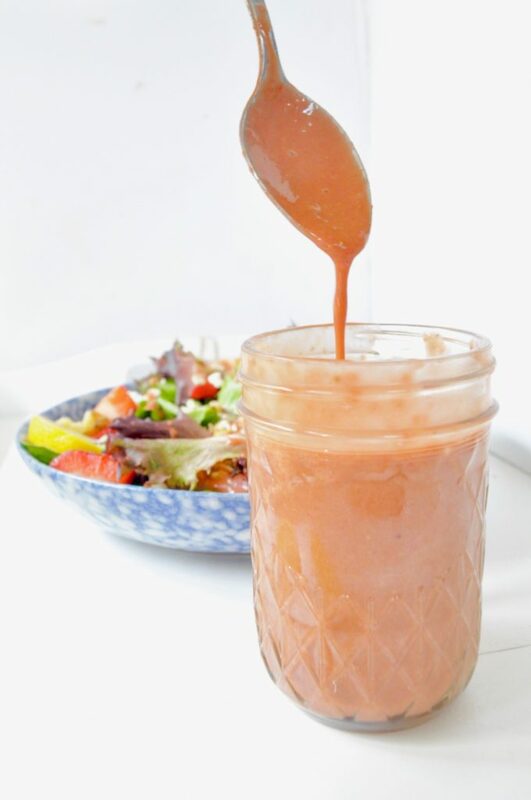 For the strawberry vinaigrette, combine all ingredients in a blender. Blend until smooth. For the salad, combine all ingredients and top with dressing. Makes two salads and 3-4 servings of vinaigrette.